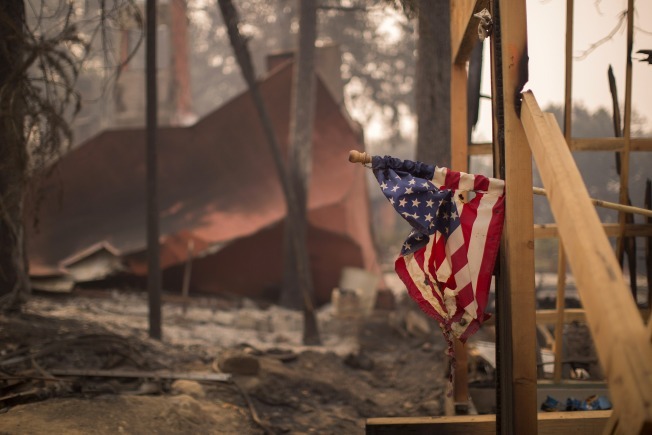 NAPA, CA -OCTOBER 11: A construction site American flag hangs partly melted among houses in Soda Canyon that were destroyed by the Atlas Fire on October 11, 2017 near Napa, California. In one of the worst wildfires in state history. Organizers announced Thursday that they were canceling Walnut Creek's annual Oktoberfest, citing air quality concerns caused by the deadly North Bay Area fires and guidance from health officials. Hosted by the Chamber of Commerce, Walnut Creek Downtown, and Labadie Productions, the city's iteration of Oktoberfest was slated to take place this coming Saturday. It's unclear if the festival will be rescheduled. "Our hearts go out to the victims of our neighbors who have suffered such loss and devastation," the three hosts said in a joint statement announcing the cancellation. They encouraged would-be attendees to donate instead to fire relief through the Safeway Foundation, which usually partners with Oktoberfest and is now matching customer donations up to $500,000. The grocery chain's fundraiser is just one of many active campaigns dedicated to fire relief and providing aid to victims. An homage to the festivals that take place each year in Germany, Oktoberfest is an annual tradition in Walnut Creek and other parts of the Bay Area. Attendees typically wear costumes and dine on festive foods. In recent years, Bay Area festivals have become a hybrid celebration of both German food and drink — especially beer — and Halloween. Most of the other Bay Area Oktoberfest celebrations took place in late September this year. The Peninsula Oktoberfest, also slated for this weekend, has not announced a cancellation. The air quality in the Bay Area has been especially poor since Sunday, with little sign of letting up as the fires continue to ravage the region's wine country. That air has been blowing into the East Bay, masking the sky in a noxious opaque haze. Walnut Creek's decision comes on the heels of schools across Contra Costa County shuttering classes. The National Weather Service has issued "Red Flag" warnings for large swaths of the Bay Area, advising people to keep indoors and refrain from burning materials. Find extensive wildfire coverage here.